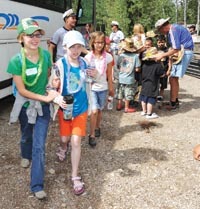 Following a recent decision by the American Cancer Society to stop funding camp and college scholarship programs nationwide by year’s end, Camp Rainbow Gold has flown from under the society’s wing in pursuit of private, independent 501(c)(3) status to continue its offerings for Idaho kids with cancer and their families, including summer camps at Cathedral Pines, north of Ketchum. A recent Rainbow Gold news release states that the American Cancer Society recently conducted a comprehensive analysis of its programs, services and fundraising initiatives “in an effort to maximize the organization’s efficiency and effectiveness in fighting cancer.” According to the release, the analysis resulted in the society’s “very difficult but strategic decision” to phase out its funding of camp and college scholarship programs that support activities such as Rainbow Gold. The release states that Rainbow Gold, which is reaching its 30th year of operation, plans to continue—“at no cost to families”—all programs, services and camps that it offered prior to the transition, including its college scholarship program, all camps at Cathedral Pines, its Winter Retreat and its annual Share Your Heart Ball benefit, usually in late February or early March. According to the release, the camp will achieve independence on Dec. 31. For more information about the camp or how to support it, visit www.camprainbowgold.org.